A special treat for jigsaw fans with the Quest for the Golden Prim! 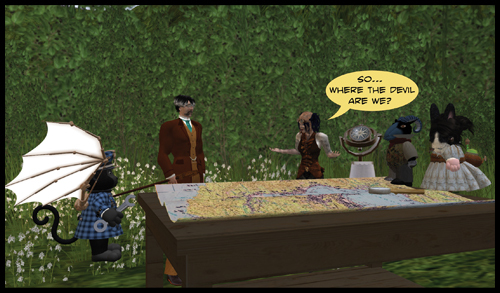 The web comic The Quest for the Golden Prim comes out every Sunday. Captured in Second Life, it features the adventures of a disparate group of explorers and their enemies as they embark of a desperate hunt for the mysterious Golden Prim. You can read more about it on the website – including the archive of back issues. As well as the episode, each week there is an associated game, which will lead you to discover more about the story, or about the characters. Sometimes there are quizes, cryptograms or word searches. This week, the game is jigsaws. There are three jigsaws to solve, and in each of them, a secret word is hidden. Solving that will help you to find the hidden information. And we think the images are rather fun too! One of the jigsaws to solve is this! Next Post: Prim Perfect Talks at the Home and Garden Expo: Cozy Homes and Meeroos!